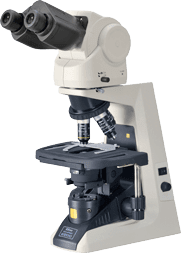 Educational Microscope Eclipse E200-LED | EINST Technology Pte Ltd.
Nikon’s top-of-the line student microscope, the E200-LED features the same infinity corrected optical system used in Nikon research microscopes. Turning the microscope upside-down to replace lamp is no longer necessary. Simply open the top corner on the base to replace the 6V/20W or 6V/30W halogen lamp safely and easily. CFI Achromat DL and other higher-grade CFI60 objectives can be used.